With the cost of IP-based surveillance cameras, access controllers, and other security devices continuing to fall, there is a lot of interest in deploying such equipment pervasively. The challenge in such applications, however, is wiring. 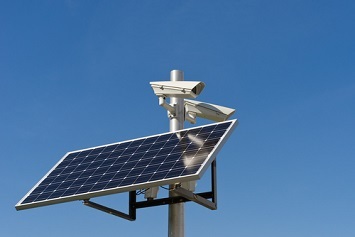 Often, cameras and other devices need to be placed in areas where electrical power is readily available, but network connectivity is not. Pulling network cabling to such locations is often not practical, either due to prohibitive costs, right-of-way issues, and/or distance. Fortunately, if electrical power is available at the remote location, it is usually much simpler and cost-effective to establish a wireless backhaul link. The technology most commonly deployed is based upon Wi-Fi. However, there are a lot of vendors out there with an often dizzying array of products of different capabilities and costs, so it can get confusing as to what products will be best suited to your applications. What radio frequencies are available, and which ones are best for my application? Licensed: Licensed portions of the spectrum are usually either owned and operated by the government or leased out to specific organizations for specific purposes. The most familiar applications for the licensed spectrum include radio and TV stations, satellite radio, and cellular carriers. Some bands are also reserved for long-distance point-to-point (PTP) radio links, such as the 6 Gigahertz (GHz) spectrum and 11 GHz spectrum. The advantage of licensed PTP links is that there is no interference on the channel, as the licensee is the only entity allowed to use their allocated frequency channels in a particular geographic area, and rogue users face heavy fines if they are caught violating the license. Licensed links are typically very expensive to deploy, often costing >$10k per link. LigoWave® has recently introduced a reasonably cost-effective 6 GHz licensed link product in the USA market. Unlicensed: Unlicensed portions of the spectrum are allocated to general use, so long as particular maximum transmit power and interference robustness regulations are maintained. Cordless phones, Wi-Fi, and Bluetooth® are common applications on unlicensed frequencies. 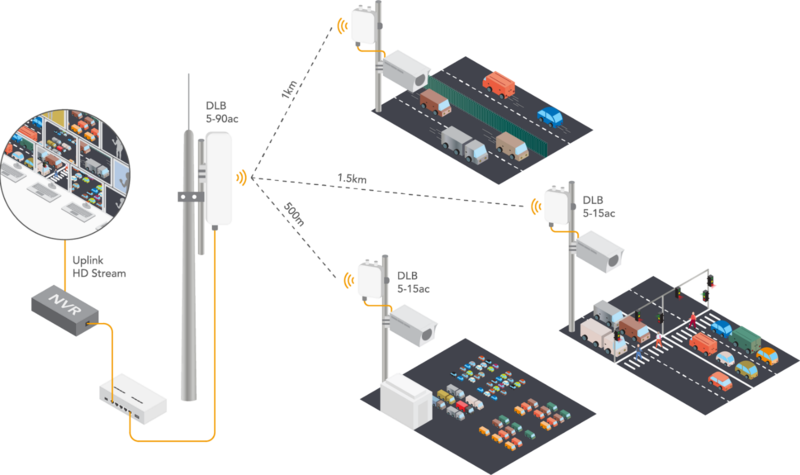 For point-to-point (PTP) and point-to-multipoint (PTMP) wireless links based on Wi-Fi technologies, 2.4 GHz and 5 GHz are the most common frequencies. Typically, most surveillance applications will utilize 5 GHz links, as there is more spectrum available at 5 GHz and there are fewer sources of interference, allowing for more reliable as well as faster data links. The advantage of using unlicensed frequencies is that one doesn’t need to go to the FCC every time you want to deploy a radio system, making it significantly cheaper and faster to deploy. The disadvantage, however, is that your neighbors can also erect similar systems next to you, which can cause interference. Interference is analogous to being at a cocktail party in a loud restaurant; if there are only a few people talking, it is easy enough to carry on a conversation, but as the room gets more crowded and more people are talking, the level of noise increases and the slower and louder you need to talk, and often you need to repeat yourself in order to be understood. Many common environments, such as residential garden-style apartment complexes, are so infested with Wi-Fi that the 2.4 GHz and portions of the 5 GHz spectrum are completely saturated, making the addition of point-to-(multi)point links in such environments very challenging. With the increased demand for spectrum, the FCC is studying ways to open additional bands, such as the full 6 GHz band (5.9 GHz–7.1 GHz), for unlicensed uses. In doing so, there are likely to be additional protection mechanism requirements to ensure that existing license holders can use their licensed portions of the spectrum without interference. Semilicensed: Semilicensed portions of the spectrum are essentially reserved for specific applications, but one does not need to get approval from the FCC to deploy a radio system on that frequency as long as it is for that application. The most common example of this is the public safety band at 4.9 GHz, which reserves 50 Megahertz (MHz) of spectrum for public safety applications (e.g., fire, police, and emergency responders). LigoWave® sells PTP products on this spectrum for these types of applications. What are the differences between wireless backhaul AP models? Speed: In wireless applications, equipment is generally sold on throughput, meaning the speed at which data that can be passed across the wireless link. It is easy to sell wireless on its speed capabilities, though highest speed link isn’t necessarily the best option for the specific task. Access controls and industrial Internet of Things (IoT) sensors tend to require very little data, so less expensive slower links may be perfectly acceptable. For CCTV and other video surveillance applications, throughput requirements will depend on the number and image quality of the cameras at the remote end. For example, a typical 2 MPixel camera at 15 frames per second (fps) only requires about 5 Megabits per second (Mbps), though a 10 MPixel camera at 30 frames per second will require over 40 Mbps. LigoWave® has also developed iPoll, a proprietary wireless protocol available in every LigoWave® PTP/PTMP product. iPoll is optimized for PTP and PTMP performance to minimize overhead and latency while integrating quality of service (QoS) algorithms to prioritize voice and video traffic, which provides over 30% faster throughput compared to the standard WDS algorithm used by most manufacturers. In practice, iPoll enables more cameras and/or higher image quality cameras to be deployed using the same hardware generation. To learn more about LigoWave® and our wireless CCTV solutions, please visit https://www.ligowave.com/solutions/video-surveillance. Link technologies based on the older Institute of Electrical and Electronics Engineers (IEEE) 802.11n specification have limited throughput capabilities, yet they are still both adequate and cost-effective for low-bandwidth applications. For 2.4 GHz, applications are limited in practice to 20 MHz channels, which will limit the maximum throughput of the link to about 40–50 Mbps. The 2.4 GHz band also tends to have a lot of interference from both Wi-Fi and other sources, making it of limited usability. For 5 GHz 802.11n, 40 MHz channels can be used, which will enable achievable bandwidths in the 90 Mbps range. Link technologies based on the newer IEEE 802.11ac specification can use 80 MHz channels and some additional enhancements to achieve significantly faster throughputs. Using iPoll, a LigoDLB ac product can potentially achieve throughputs of about 500 Mbps. Comparable products from other vendors using standard WDS will peak at approximately 300–350 Mbps. These links are suitable when there are a lot of remote cameras, and to enable future expansion of additional cameras without exceeding the capacity of the total link.In many cases, managing the speed and monitoring the usage of each link is also critical. LigoWave® provides several traffic management mechanisms in a very easy-to-use format to monitor the links and ensure that every endpoint is receiving its fair share of bandwidth, or its fixed share if you are selling bandwidth access to different customers. Check out https://www.ligowave.com/solutions/traffic-management for more information. Range: The range of an access point ultimately depends on the antenna being used. Antennas are essentially lenses for radio frequencies, focusing the RF energy in a particular direction, both to enhance the ability to transmit (i.e., talk) as well as the ability to receive (i.e., hear) in that direction. Antennas are measured by their gain, i.e., level of directionality. Typical Wi-Fi applications utilize low-gain omnidirectional antennas; since client devices move around, one does not necessarily know or control where the client device is going to be located relative to the access point. In point-to-(multi)point applications, the base stations and remote ends are in fixed positions, so high-gain directional antennas are commonly used both to increase the total distance of the link and to minimize the amount of potential interference from surrounding radio systems. Vendors like LigoWave®, which specialize in PTP/PTMP applications will generally offer multiple models within a product generation, the key differences being the antenna. Models with highly directional antennas (e.g., the LigoDLB 5-20ac with a 20-dBi antenna and a 16oH x 16oV field of view) are usually recommended for the PTP and for the remote endpoints for the PTMP, where models with antennas that have a broad field of view (e.g., the LigoDLB 5-90 ac with an 18-dBi antenna and a 90oH x 20 oV field of view) are good for the base station in PTMP applications needing to cover a large area. How does this all translate to implementing a real wireless backhaul deployment? Some wireless backhaul projects are ambitious, especially if there are many buildings to reach and line-of sight isn’t always directly achievable from the location of your network video recorder (NVR). Below is a recent example using LigoDLB 802.11ac access points to connect approximately 50 cameras (average camera is 4 MPixel at 20 fps à 15 Mbps/camera), spread across 19 residential apartment buildings. All links are remotely monitored using the Infinity Controller, which is a cloud-based controller for all LigoWave® Wi-Fi and PTP/PTMP products, available either publicly hosted (i.e., at LigoWave®) or privately hosted (i.e., at your own data center). Where can I get assistance with my particular wireless backhaul project? LigoWave® offers free 24-hour phone and e-mail support, covering both presales engineering as well as post sales deployment and troubleshooting. We also provide free online tools for planning PTP/PTMP links, along with YouTube training and unboxing videos, webinars, and full certification programs. If you have new projects to deploy, LigoWave® is here to help. Jason D. Hintersteiner, CWNE #171 is the Director of Business Development at LigoWave, a wireless equipment manufacturer specializing in point-to-(multi)point wireless backhaul, as well as indoor and outdoor Wi-Fi applications. He is an expert in the small-to-medium business (SMB) Wi-Fi market, possessing a unique perspective on the industry by having worked in engineering and marketing roles for both wireless Internet service providers and access point equipment vendors. 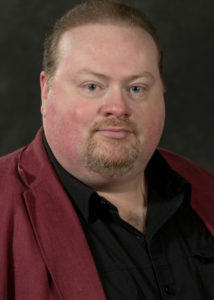 For more than a decade, Hintersteiner has been a principal network architect and analyst for several hundred wired, Wi-Fi, and point-to-multipoint wireless networks, spanning multiple verticals including hospitality, student housing, assisted living, residential apartments, wireless surveillance, religious non-profit, education, warehouses, factories, commercial offices, and retail. He has also taught dozens of vendor-specific training courses, as well as being an expert witness in legal cases involving network forensic analysis and patent litigation. Hintersteiner holds both a Bachelor of Science and a Master of Science from the Massachusetts Institute of Technology, a Master of Business Administration from the University of Connecticut, and he is a Certified Wireless Network Expert (CWNE #171).